Plan ahead! Skim Spells to decide which spells you want, noting prerequisites. Earmark enough character points from your advantage allocation to buy the highest level of spellcasting talent (Bardic Talent, Magery, or Power Investiture) your choices require. For a bard or wizard, count prerequisite spells, their prerequisites, and so on, to determine how many spells you're really buying – you may need to use points from quirks to afford them all, and you might have to shorten your wish list. If your favorite spells aren't available to your chosen profession, rethink your line of work before going further. Have the energy to work your magic. Mostly this means Fatigue Points (FP) and Energy Reserve (ER). (Don't count on burning Hit Points – that's a last-ditch measure that causes spells to fail and knocks you out!) Focus on ER, because it recovers simultaneously with the FP you already have, and regenerates even when not resting. Regaining FP and ER goes faster with Recover Energy (Spells, p. 38) at skill 15+, so reserve character points for that. There's also energy in your power item (Adventurers, p. 115); you'll probably get to tap it just once per adventure, so it's best for emergencies, but consider trading points from quirks for cash and spending some money here. Learn key spells at skill 15-19, which reduces energy cost by one; if you can afford (IQ + spellcasting talent) = 17+, the minimum 1 character point per spell buys skill 15+ with IQ/Hard spells. Use tactics. About 80% of spells are Regular or Area, so you'll often be casting at -1 per yard of distance. You can reduce distance with a magic staff (Spells, p. 9). Don't count on staying out of harm's way, but jet spells (Spells, p. 12) increase reach in melee combat and Missile spells (Spells, pp. 13-14) can blast opponents from afar. Don't neglect mobility, either – take a step toward your target when you Concentrate or Attack, and avoid spending so many FP that you're at half Move (Exploits, p. 63), barely able to maneuver. 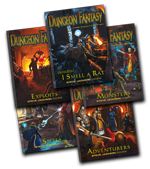 As you'll probably end up in the action, see to your active defenses, whether by wielding a quarterstaff (+2 to Parry), getting a Defense Bonus (from a cloak, shield, or Shield spell), or learning a Blocking spell (Spells, p. 14). Remember that spells require success rolls. The leading causes of failure are distance penalties and the -1 per spell "on" (Spells, p. 11). Get close to subjects, friend or foe – and be careful about putting tons of "buffs" on yourself or your allies, or tagging numerous foes with enduring spells. Offensive spells are often Resisted, meaning powerful enemies may shrug them off; only cast these when your effective skill is high (few penalties), preferably on opponents known to have low HT or Will and no Magic Resistance. Jet and Missile spells aren't Resisted, but they can miss, and enemies can dodge or block, so choose easy-to-hit victims. In short, as energy is a valuable resource, don't waste it bouncing expensive spells off well-protected subjects (and if you can, cast a big Missile spell before the fight, recover the energy, and start with heavy firepower "for free"!). Avoid the "artillery fallacy." Large Area spells can affect multiple foes in theory, but many are so slow to cast that enemies won't be bunched up by the time you're done, so expensive that you can't recast them, and/or Resisted. Most jet and Missile spells affect one target – and for the exceptions (Concussion, Explosive Fireball, Explosive Lightning), damage diminishes quickly with distance. In combat, casters are snipers rather than artillery, striking vulnerable individuals with specific spells that can affect them – or they're medics, helping nearby allies. Gear up. Consider a magic staff – and if your weapon is one-handed (a "staff" can be a one-handed stick), pair it with a cloak or shield. Even if you're no warrior, wearing armor can save your life. If you have spare cash, consider paut (Adventurers, p. 116) for an energy boost – or charged scrolls (Adventurers, p. 117) for when your energy is gone. To exploit mobility, seek ways to keep your loadout from encumbering you; e.g., Fortify (Adventurers, p. 118) on your free starting clothing adds DR without significant weight. At the end of your shopping trip, designate your priciest purchase as a high-capacity power item. 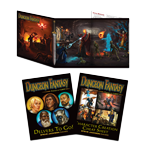 And after each adventure, hang on to scrolls and books containing spells to learn, magic items that store energy or grant bonuses to individual spells or even IQ, costly gewgaws that make excellent power items, and rare artifacts intended for members of your profession. 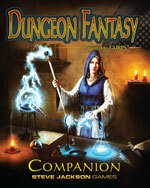 Dungeon Fantasy Magic Items, in the Dungeon Fantasy Companion, touches on many of these areas.